Melissa & Doug's fantastic dress up sets are, in our view, the best on the market today. 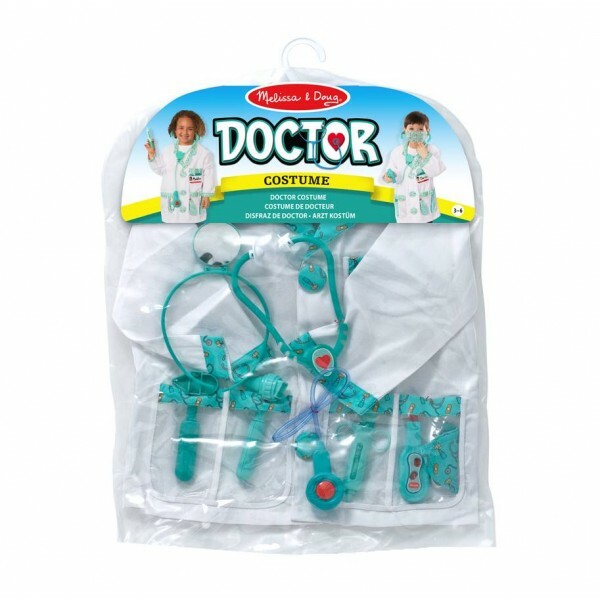 Made with wonderful attention to detail, and packaged beautifully, they're a great way for little ones to explore imaginative role play in quality and style. With this set, your little doctor will be fully equipped with a jacket and face mask, a stethoscope with sound effects, a reflex hammer, an ear scope, a syringe, and a name tag to personalise. The set is made with exceptional quality, looks stunning, and is made to last. Dress Up Sets are fantastic for encouraging imaginative play, social interaction and communication skills. All Melissa & Doug role play sets are crafted with care, completely child safe, non toxic, and meet or exceed all European safety standards.